How do I know that steel frames will be strong enough? Does TRUECORE® steel comply with the relevant Australian Standards? How can I be assured that frames made from TRUECORE® steel are good quality? TRUECORE® steel is made by BlueScope to strict tolerances and fully complies with all relevant Australian Standards. Light gauge steel framing is a precision engineered product manufactured to accurate dimensions and this helps to ensure walls are straight and true. Steel frames don’t shrink, twist or warp over time which may help reduce builder call-backs and ongoing maintenance issues. I’ve heard frames made from TRUECORE® steel are insecticide free. What does this mean? Because it’s termite and borer proof, TRUECORE® steel doesn’t need to be treated with insecticides to keep these harmful pests from eating your frame. 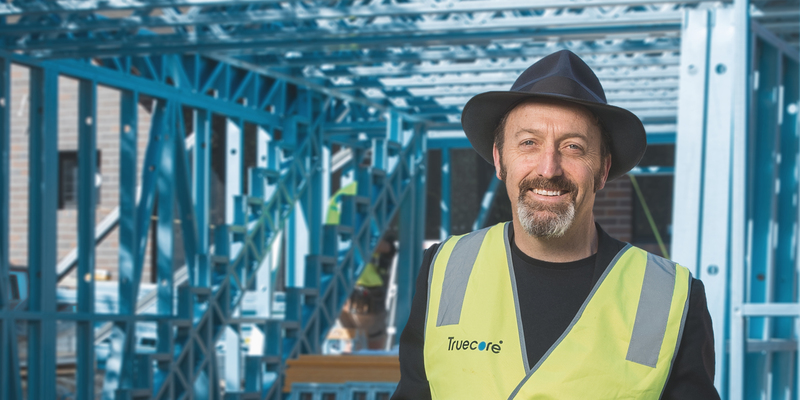 So, if you live in an area affected by termites and if minimising insecticides around your home is a priority for you and your family, building your home with frames made from TRUECORE® steel is a great way to start. Do I need to undertake chemical or physical termite protection if I use a steel frame? Are steel frames quick to install? Because they arrive to site pre-fabricated, frames made from TRUECORE® steel are ready to be installed straight away. Some builders have suggested there are time savings compared to some other building materials. We recommend you speak to your builder for an estimate of the build time for your specific project. Are steel framed houses thermally efficient? A frame made from TRUECORE® steel can be lined, insulated and clad in a variety of ways which can deliver the desired thermal and acoustic properties. Yes, steel framing can be fixed directly to a concrete slab, or to steel flooring systems on brick, concrete, or steel piers.